On 7 September 2011, an advanced constructed and complete bow was found at the edge of the Åndfonne glacier in Breheimen mountain range. 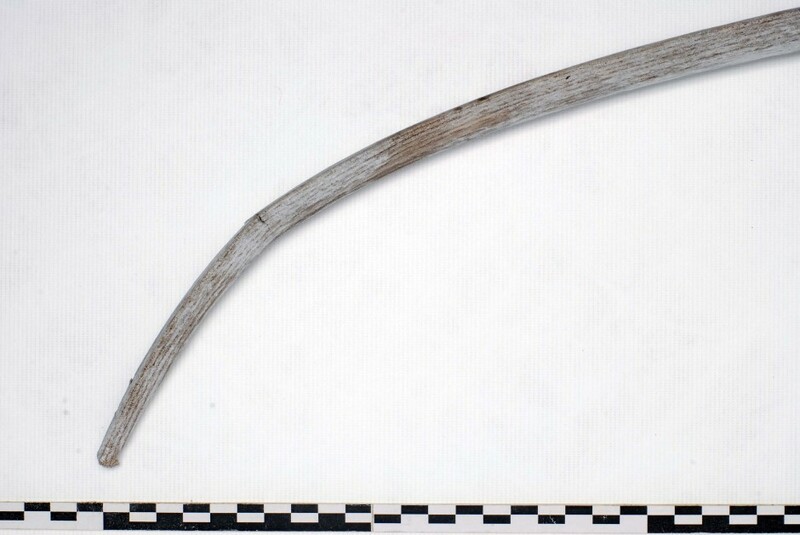 The C14 dating shows that Norway’s oldest and best preserved bow is 3300 years old. The 131 centimeters long bow was discovered by archaeologists in connection with the last check before summer fieldwork was completed. The bow was found at the ice edge about 1700 meters above sea level. This shows how important it is that archaeologists are present just when the ice is melting. Findings of complete bows are very rare, and it turned out even rarer after the results of the C14 dating returned from the laboratory in the U.S.: The bow turned out to be 3300 years old – dating back to about 1300 BC – in other words from the early Bronze Age. It is the oldest bow ever found in Norway, and in addition it is in perfect condition! It is made from one piece of hardwood. Analysis of the design shows that there has been an experienced and skilled bow maker who designed it. The bow is broken at one end, probably during hunting, which is probably why it was left behind by the owner. Findings of both arrows and scare sticks dated back to the Iron Age shows that the Åndfonne glacier in Breheimen National Park has been an attractive hunting area for thousands of years. In the summer, reindeer and other animals seek glaciers and snowfields to escape insects, and hunters hid at the edge of the ice. Findings of bows in Norway, and in the rest of the world, are very rare. This is probably primarily due to the fact that bows are made ​​of materials that quickly decompose. The so far oldest finding in Norway is parts of a longbow made ​​of yew from the Veiem tomb in Grong, Nord – Trøndelag County. The tomb is dated to the 500’s AD. Approximately half a bow from the Gokstad find dating back to around 900-905 AD is also preserved. The bow from Breheimen is a surprising finding. Very few bows are known from the Bronze Age: The closest we come is the so-called De Zilk-bow from the Netherlands made ​​of yew dated to between 1950 and 1680 BC, and a bow from Fiavé-Carera, Italy dated to 1600-1400 BC. Both of these bows have a narrowed and thickened grip that is also found in Danish Stone Age bows. However, the bow from Breheimen has no marked grip which is similar to the later longbows (…). The Breheimen-bow’s cross section is interesting. It appears to be oval in the middle part, while the outer parts have a triangular cross-section. The back, which faces away from the archer, consists of outer year ring of the original tree stem. This provides a very safe bow, with continuous fibers throughout the bow’s length. The belly, the side facing the archer, is shaped so that the pressure from being bent is distributed as evenly as possible along the entire length. The ends with triangular cross-sections are a known technical tricks that you see on some prehistoric and historic types of bows. By giving the belly a sharp “keel”, the bow feels smoother to pull and stores more energy. Stiff, lightweight endings also provide a rapid straightening of the bow, which further increases the speed of the arrow. Thus, this is no primitive “stick”, but a carefully designed and crafted tool. Moreover, the quality of craftsmanship is high – with a nicely shaped cross-section and slender lightweight endings. The Breheimen-bow is currently on display at the Norwegian Mountain Museum in Lom. I have a cousin in Karmøy who makes replica Viking longbows, I’ll have to see if he heard about this. 1. The tips cannot have been deflexed originally, but is a result of stringfollow. Maybe the original have been thrown away stringed. It looses WAY too much efficiency that way, and the Old wasn’t stupid. I liked the story a lot, I’m new to SCA archery but have been hunting with bows for years. Cool find, but I always have to laugh at people not familiar with ancient artefacts, like the author of this article clearly is. “Advanced” and “designed with care and experience” are not the same thing. It was demonstrated in the Bowyer’s Bible that you can make a very similar bow with nothing more than a few broken shards of stone. This is just about as primitive as a bow can get. I hope the author realizes that at the same time as this West and Central asia was beginning to perfect the composite bow–the most advanced technology in archery until the introduction of fibreglass. It’s a cool, instructive find, but definitely just a primitive stick. We wish you a very nice Christmas! You obviously haven’t tried to make one…? There is nothing primitive with the design of this bow! Everything from the selection of the piece of wood, the D-shaped mid-section to the more and more triangular tips witness a deep understanding of the properties of Elm, and the mechanics in a bow as short as this. I’ve made two of them with ultrasharp steeltools, and that makes me even more respectful of the competence of the bowyer 3300 years ago. The near exact replica I made is smooth to draw, easy to handle in a cramped space and a brilliant target bow for the ranges these bows were used under. (7 – 25 metres). Dag, I think you’re confusing primitiveness with crudeness. They are different things. I would agree that there is little that is crude about this bow. It is a well made, well considered bow. The performance requirements of a hunting bow don’t change over time, and they relied on that performance to live. If the original truly was a 28 lb bow, then it’s not all that great a performer anyway and would likely have required poison arrows for anything large. I don’t know about you, but that style of hunting (practiced by indigenous peoples around the world), is considered unnecessarily cruel given our advanced technology. I also submit that the inhabitants of Asia Minor would have found this bow crude. Central Asia was producing armour piercing war bows. That’s advanced. I apologize if I’ve come off too harshly. Edifying the ancients without perspective is a pet peeve of mine. To my mind it lends itself to a skewing of historical fact and diminishes the role of the human mind’s powers of observation and reason. The maker was skilled, the bow performs nicely, but in a world or armour piercing war bows, it’s a flint striker among zippos. I neglected to mention I’ve made bows with steel tools as well. A 30-40 lb ash longbow, a 60-70 lb. long bow of yew, and countless toy bows as a kid. The stone age tech is a challenge I want to try. #Dag Sunde: You say the curves of the bow is a result of stringfollow. I think the bow has this form and have been stringed in princip like a recurve bow. Actually the form is slightly as a horsebow. In the enlargement picture of the one bow tip, you can see a little – maybe – string nock. The location fits with my theory, that the bow could have been stringed like a recurve bow. I don’t quite get what you mean here…? the bow is the opposite of a recurve… its tips have a severe deflex, with setback in the handle. The only way Your description fits, is if you turn the bow backward so the tips is pointing away from you. Is that wat you mean? There is (I think) only one find in history where (maybe) the full, untouched Outer growthring have been the belly of the bow, and several broken rings have been the back. If you find a selfbow With a full growthring on one of the sides, it is *always* the back of the bow. If you string this bow the way you suggest, I guarrantee you its going to break on the first shot. The Bowyers Bible Vol. 1 or 2 described the Holmegård bow erroneously as a “Backward bow”, but later admitted that this was a misconception. Yes – the tips pointing away from you – in princip like on a recurve bow and some modern longbows. In princip like this one, except from that this example has almost all the limbs bending forward away from archer. But in princip like this. I cannot see from the two photos in the article, what side of the bow is away from the shooter – in a D-shaped bow, that would be the flat side. But it is difficult to see what is the flat side. I saw you replica (very nice by the way) – but how can I see that this old bow is made to be stringed the same way?? Note that the drawings of the growth-rings and their pattern is accurate… He is a bowyer himself. Thanks for the very interesting article on the find of this ancient weapon. I’m not an archer, or maker of bows. More just a humble photographer who is deeply interested in cultural/artistic discoveries from historical Scandinavian sources. Tyler…. while I don’t have a dog in this fight, I am a bit mystified by some of your commentary. Especially when you suggest that someone is confusing primitiveness with crudeness and then fail to define either for purposes of making a conclusion in the discussion. It is not our responsibility to seek this differentiation, but yours… and in failing to do so, you also fail to make your point with much strength. It sounds like you have a deeper grasp of the issues involved, but maybe you could simply take a breath before jumping in on the others and create a thoughtful and well reasoned argument? Primitive–lacking technological advancement. Crudeness–lacking care in construction or an awareness of the nature of the materials. That is to say, the dictionary definitions of the term. I suggest familiarizing yourself with bow construction and the history of developments in bow construction. At the same time that this little bow was made, very complex bows with a far more sophisticated knowledge of what we’d now term “materials science.” I’m using the dictionary definition of sophisticated here too, but I’m happy to define it for you if you feel it will make my argument more complete. Perhaps my argument doesn’t sound well considered because I’m making allusions to things that are common knowledge to bowyers. It is not an advanced bow. Compare this bow to the bows of the Western Asia of the same time period. The fact remains that you can make a bow of this type using stone tools in an afternoon (and this has been demonstrated numerous times, not only in the above Bowyer’s Bible article I cited, but other places as well). The conclusion I was hoping you’d make is that ancient cultures are not advanced technologically, but they aren’t stupid. Saying that this bow is advanced is a rather clueless modern thing to do. The maker of this bow likely worked with and knew the properties of the wood better than most modern carpenters. But to say that makes it advanced is wrong. Stonehenge was made with a more primitive tool set than the Roman fortifications that came after, but that doesn’t mean it wasn’t well considered. Ptolemaic astronomy is more primitive than Copernican, and Copernican more primitive than modern astronomy, but that doesn’t make Ptolemaic astronomy crude. It’s actually a very well considered and well crafted theory, given the resources at the time. The Parthenon is relatively primitive architecturally, but extremely well crafted. See how that works? It’s a well made little bow, but it’s not advanced. As a bowyer, after reading Tyler’s explanation of his choice of words I tend to agree with him. Primitive is derived or related to Primal or that which comes first. It is not etymologicaly linked to the word technology. Advancment also indicates that which comes first or in front but has come to be a value judgment. Comparing an asian war bow with a Scandinavian hunting bow is actually redundant here. If something works, why fix it? Bows of similar simple design were used at Agincourt – obviously stronger. The advantage with a lighter weight bow is that it can be more accurat at shorter range on smaller game such as ptarmigan or arctic hare. Using an asian recurve warbow for that would not be appropriate. As for making the bow with stone tools in an afternoon, this is an exaggeration. You first have to find a suitable tree – not many around glaciers (above the treeline). If you make a bow from green wood you might be lucky with your material and it will not warp in which case you are either extremely lucky or you have an advanced knowledge of how and where to find suitable trees – which means you are something like a master craftsman – remember we are talking arctic or sub-arctic here (so you can probably forget elm, ash or hickory). If you choose to harvest and cure your wood it dries and becomes harder. I suggest that it would be a very long afternoon with stone tools – especially the tillering.In the sub arctic environment there is not a great choice of wood so being able to craft something from less than optimal materials I find impressive. I do not percieve the laminated, recurve bows of the east as advanced. They can give more cast, draw sweeter and have less string follow but they are also more complicated and need more care and maintainance particularly in the arctic climate . And if we begin citing from any bible (I have read most) we find lots of nuances and even contradictions. 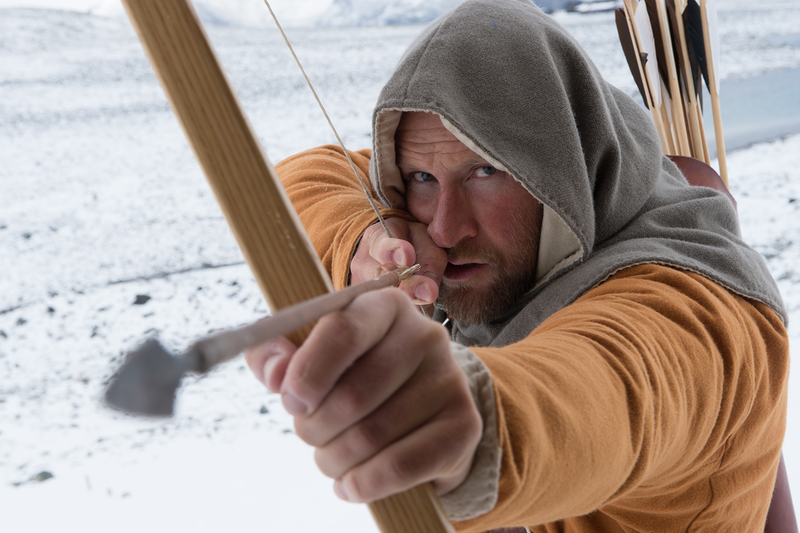 In all traditional bowmakers and archery dialog is the contention of longbow vs. recurve. Can we not just be allow ourselves to be impressed by this article which sets bowmaking and indirectly craftsmanship of the Bronze Age in a positive light? By the time that bow was made we had 7,000 years of experience making wooden bows. This bow had been fine-tuned by thousands of years of trial and error, prodded by growling stomachs. At 51″ it’s right at the average bow length of pre contact American Indian bows. And similar in design to some. It may have been made using bronze or stone tools, or both. In either case only a few hours of actual labor was needed, plus a few day of drying once the stave was reduced to near finished bow dimensions. A crowned belly, especially with elm, leads to inefficient performance, due to resulting to large set/string follow, as seen in this bow. But it’s a labor-efficient design if using simple hand tools–much faster and easier to reduce the belly to a crowned shape than flat. The non-narrowed grip, putting the that extra ten-inches or so of wood to work is especially wise for a bow of that length, reducing strain everywhere else along the limb. A crowned belly automatically becomes a fairly triangular section as the bow narrows toward the tip; not a good design if taken to sharp extreme, but ok if that portion of the limb is left thick enough for proper tiller shape. Guessing the bow to be of elm, ash, or similar, and about 1 1/4″ wide, drawn to about 24″, the bow was likely no stronger than 38lbs, shooting a 400-grain arrow at about 135fps. A stealthy hunter, able to get within a few yards, or one hunting from a blind, and using small ‘bird-point’ arrow heads, could down the largest deer with such a bow. The triangular section on this bow is more extreme than anything I’ve seen before. I’ll try to find the original drawings in 1:1 from the museum artist, and post the link here. If these are near accurate I’ll 2nd your comment concerning the bow’s triangular section; one bow in a thousand might be that extreme, and for good reason: with so little wood to resist compression the bow would take extreme set if drawn 24″. Two unlikely things would help it: If braced extremely low, or if the tips were intentionally deflexed. Do you have access to precise width and thickness measurements? From the above drawings I’m guessing the width at a bit under 1-inch. Is the wood species known? 24*19mm near Center, 12*8,5mm at tip. We have only those 8 w*h measurements printed on the drawing. If you zoom in, they are readable. That drawing you found should also be available in 1:1 full size. The material is considered by several bowyer’s to be Elm. The growth rings indicated in the drawing are correct from the original. I might suggest that a small, light, bow would handy for bagging grouse, and rabbits. I’ve always been told that Alaskan back country workers and travelers treasured their light weight .22 handguns, and carried them to shoot “pot meat”, especially when it was inconvenient to carry a larger, heavier weapon.